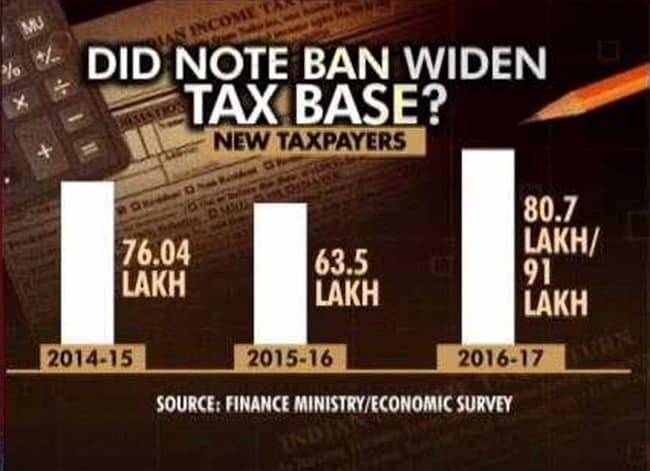 New Delhi: If the government is to be believed, the ban on high-value currency led to a significant surge in India's tax base over the past year. To back this claim, the government has released a deluge of data. Including the claim that that there was a 25 per cent increase in tax returns in the April-August 2017 period, compared to the same period last year. That is correct, but the surge is not unusual given what demonetisation was meant to achieve. 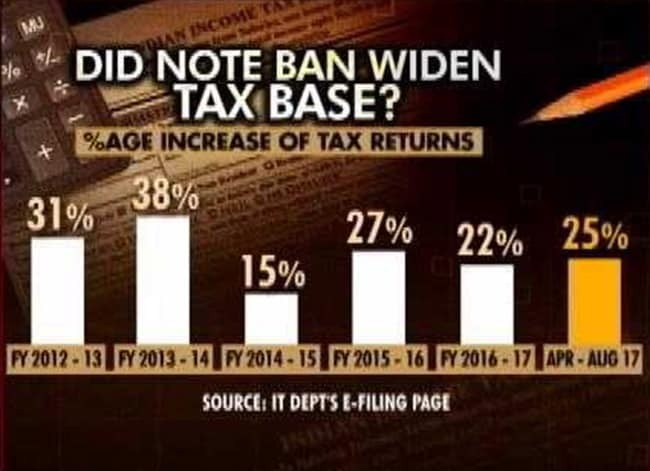 For previous years -- taking the entire financial year -- tax returns have grown at an equal or even higher pace, rising from 31 per cent in 2012-13, to 38 per cent in 2013-14. The growth fell to 15 per cent in 2014-15, before rising to 27 per cent in 2015-16, and settling at 22 per cent in 2016-17. 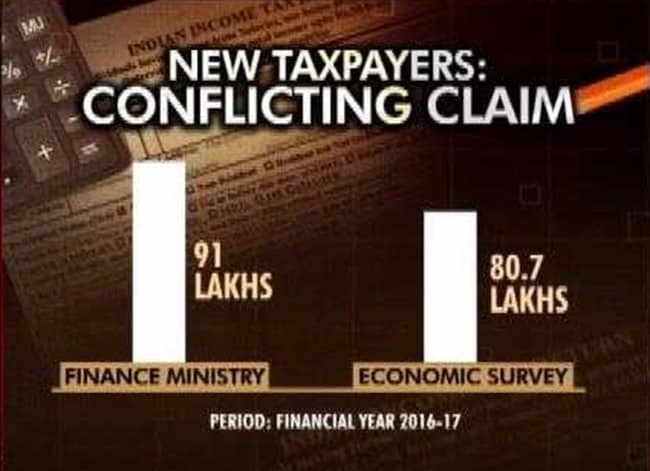 The government also says that for April to August this year, the number of taxpayers increased by 60 lakh or 25 per cent in April to, compared to the same period last year. But analysing data for the previous years in their entirety again shows that the growth in taxpayers after demonetisation is not an anomaly if you look at the entire year. The rise in the number of taxpayers was 40 per cent in April to August 2016 and 16 per cent in April to August 2015, as per the Income Tax Department's data. 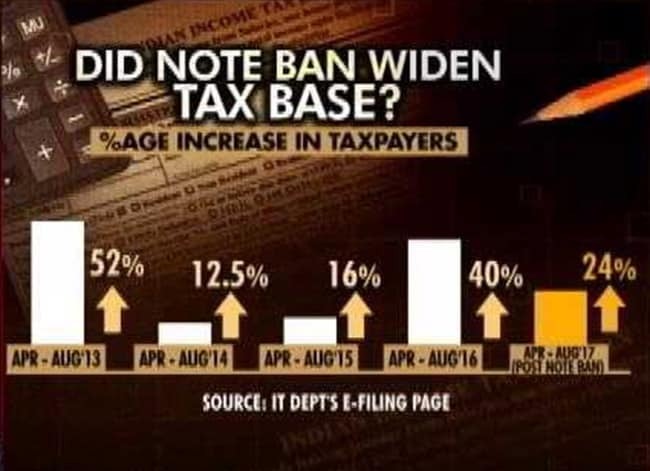 The government said that because of notes ban, the number of new taxpayers in the financial year 2016-17 rose to 91 lakh. But the Economic Survey put this figure at 80.7 lakh. In response to the different findings, the Finance Ministry said that the two figures are for different time periods, without giving any further details. But if we compare these figures -- either 91 lakh or 80.7 lakh -- with the previous years, it is clear that demonetisation did not give any significant push to increase the tax base. According to the Finance Ministry, in 2014-15, 76.04 lakh new taxpayers were added. This number fell to 63.5 lakh in 2015-16, before climbing again to 80.7 lakh (or 91 lakh) in 2016-17.